Greece’s Environment, Energy & Climate Change Minister Yiannis Maniatis has signed a joint declaration with his Romanian and Bulgarian counterparts for the development of a “Vertical Corridor” pipeline project to link the three countries. The project makes up part of the European Union’s wider effort to improve the flow of gas between member states in southern and southeastern Europe. The natural gas supply through the “Vertical Corridor”, estimated at between three billion to five billion cubic meters (bcm) annually, will hail from various sources, these being an LNG facility in Revythoussa, an islet in the Saronic Gulf, close to Athens, the TAP (Trans Adriatic Pipeline) project to run across northern Greece, and a floating station in northern Greece, currently being planned. 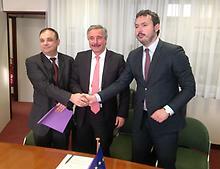 In signing the declaration, the three energy officials, Maniatis, Romania’s Energy Minister Razvan Nicolescu, and Bulgaria’s Deputy Minister for Energy Anton Pavlov, expressed their support for the project, classified as an EU Project of Common Interest (PCI), whose development will connect missing pipeline links between the three nations. The three officials also requested EU political and financial support for the “Vertical Corridor”. Maros Sefcovic, the European Commissioner for Energy Union, has already expressed his backing of the initiative taken by Greece, Bulgaria, and Romania, noting that it fully supports the EU’s overall strategy for diversified energy sources and routes. The officials acknowledged “the importance of a regional approach to address and overcome common challenges and express their willingness to enhance cooperation and work together with a view to increasing the energy security of their respective countries, the broader region and Europe as a whole,” the declaration noted. “Experts from the countries represented in this declaration will start discussions immediately on the regulatory and technical aspects regarding the realization of the gas corridor between their respective countries,” it concluded.